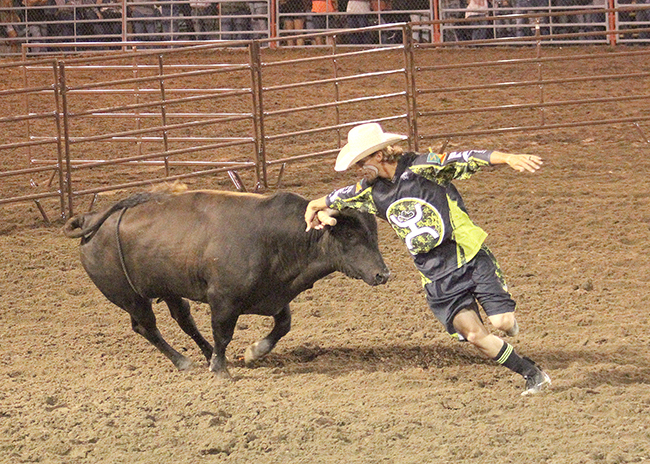 DODGE CITY, Kan. – Schell Apple knew he had to be the aggressor during Tuesday night’s Bullfighters Only Wrangler Bullfights at the Dodge City Roundup Rodeo. He matched moves with a young bull from Rockin’ B & Magnifica for 81 points, winning the prestigious Dodge City event title and the lion’s share of the prize money. He will move up a few places to 11th in the Pendleton Whisky World Standings, with several events left on the season. Apple outscored two of the BFO’s best – both sitting well within the top 10: No. 6 man Beau Schueth and the third-ranked and two-time defending world champion, Weston Rutkowski. Both Schueth and Rutkowski finished with 77 points. The three bullfighters were matched with a less experienced set of bulls Tuesday, which required each athlete to formulate a different game plan through their 60-second bouts. In the dangerous game of freestyle bullfighting, the men who find the most success utilize their understanding of the animals just as much as the athleticism. That’s one of the reasons Apple found Victory Lane. “It’s a fighter’s mentality, so it’s either him or me,” Apple said. “You’ve got to channel that every time. There are times when you’re the one who comes out on top but there’s a little bit of fear every time you do it; if you’re not scared, there’s something wrong. 1. Schell Apple, 81 points; 2. (tie) Weston Rutkowski and Beau Schueth, 77.